Day 4 – Vicksburg to Dallas, Texas – EHFC Members Talking! So what happened to the nice weather? At sunset yesterday it was beautiful, and I’d planned to leave Vicksburg around 7AM. It was not to happen. 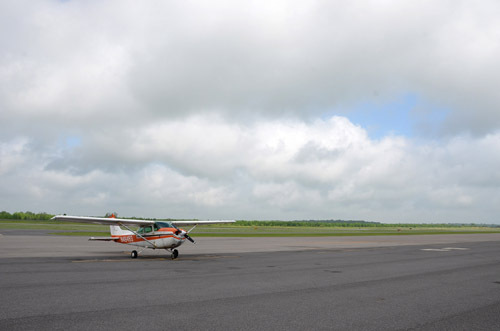 When I woke up the sky was clear and it looked good in Vicksburg – but at Tallulah-Vicksburg Regional Airport, which is actually in Louisiana ten miles west of Vicksburg, it was 1/4 mile in fog, with 300 foot ceiling. Not good. Worse, when I checked the weather along my route to Dallas, every airport was reporting IFR with low ceilings. Even when the weather at TVR started to lift, it was still IFR enroute. I sat around the airport for three hours, until at 10:00AM I started to see MVFR and VFR reports south of my intended flight path. Replan again, to change waypoints to a more southerly route over Natchitoches Louisiana (KIER) and Nacogdoches, Texas (KOCH) – not only clearer, but a theme in names… From KOCH to Cedar Creek VOR (CQY) and finally Dallas Executive (KRBD). 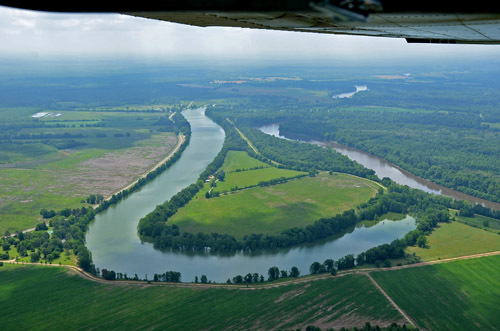 With the sun breaking through, finally, I took off from Vicksburg and climbed to 1,500 feet. The clouds were broken, with blue sky showing through, but that altitude kept us under the bases and comfortably above the earth (other than the 2,064′ tall tower I passed – they sure seem to like them tall down here!). 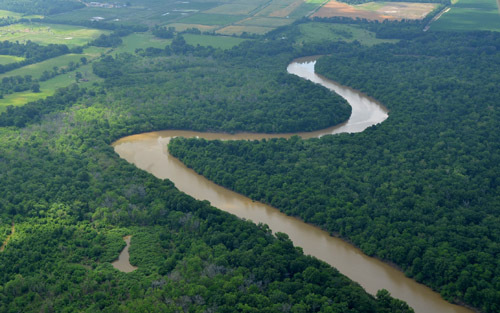 Keeping to the “river valleys” theme I seem to have started, here in Louisiana, they’re hardly valleys at all, as the rivers meander across the wet countryside. My decision to go south proved the right one, as the controllers continued to report 200-400 foot ceilings at the airports I’d originally planned to pass by. I wasn’t all that much further south – 15 to 20 miles, maybe – but it was enough. As we went further west the overcast became a bit thicker, although somewhat higher. Unfortunately, it also became increasingly hazy. 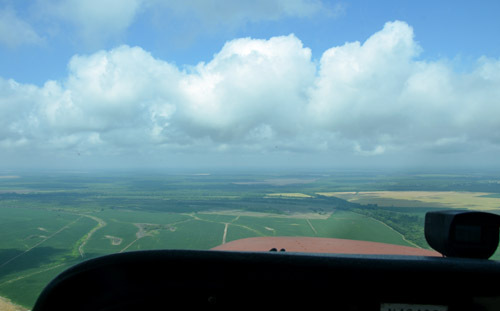 Visibility varied up and down – never IFR, but definitely not very pleasant flying (or good for photography). I crossed the border into Texas and lost radar coverage for a while, until Ft. Worth Approach picked me up about 60 miles from KRBD, which was reporting 3,500 scattered and 6 miles in haze. Half an hour later I was on the ground. The FBO, Ambassador Jet, had my rental car waiting on the ramp, and couldn’t have been more welcoming or efficient. 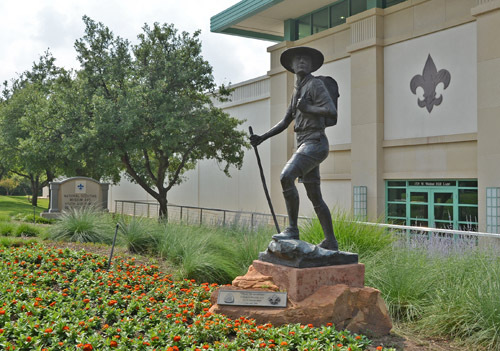 I was at the Boy Scout National HQ in twenty minutes, and after I met my contact there in person (I’ve worked with her for a number of years on several revisions of the Radio Merit Badge pamphlet), I got a personal guided tour of the National Scouting Museum and a grab bag of goodies to boot. Thanks for keeping us updated Mike…you have quite a following here on the blog! Good thing you made it to Texas (if you keep diverting South you better brush up your Spanish) Best of luck to CO.